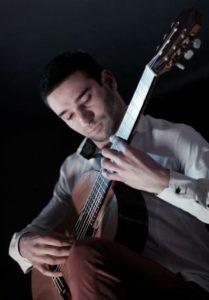 Teodor Grozdanov was born in 1991 in Etropole and started playing the guitar at age of 14. His first teacher is Simeon Simov. After he graduated National School of Finance and Business he attended in National Academy of Music “Prof.Pancho Vladigerov” where he studied classical guitar with Rossen Blakanski. He devoted himself actively to teaching and performing career.